This species is accepted, and its native range is Europe to SW. Siberia and NW. China, NW. Africa. 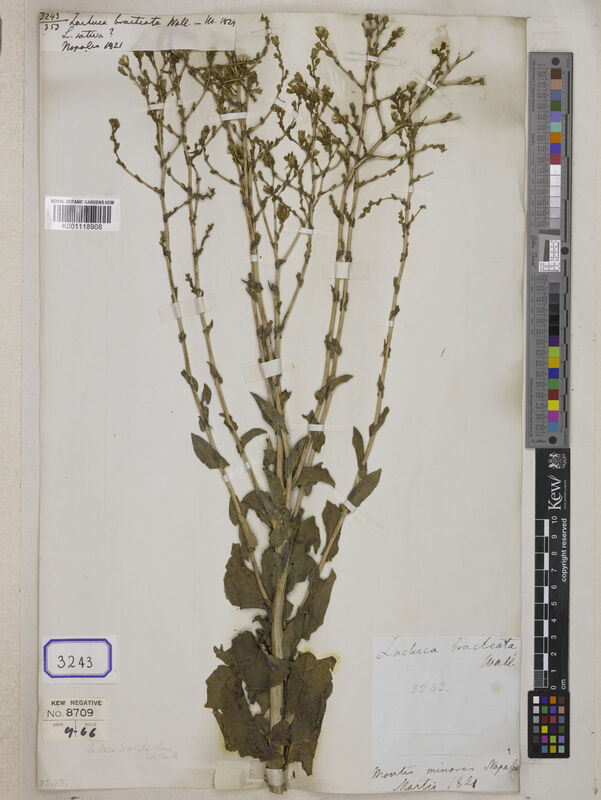 An erect annual or biennial herb up to 2.5 m. tall. Stems solitary, robust, simple below and branching above, glabrous to ± densely spinulose in the lower part, sometimes strongly so, leafy. 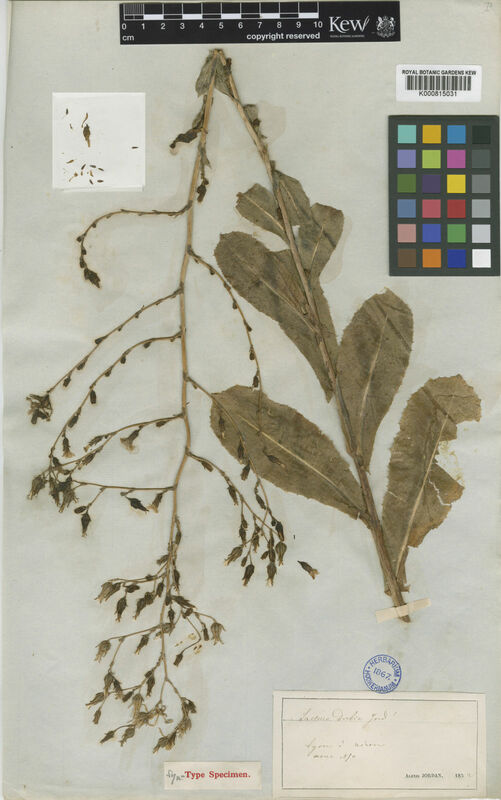 Leaves ± appressed to the stem, sessile, usually up to 10 x 6 cm., exceptionally to 20 x 10 cm., broadly elliptic in outline and runcinate-pinnate, or some leaves undivided and oblong-oblanceolate; lateral lobes 2–6, narrowly to broadly oblong, recurved; apices rounded to obtuse mucronate; margins irregularly denticulate and ± sinuate-dentate; bases sagittate-auriculate, the auricle lobes up to c. 2 cm. long and narrowly pointed; lamina glabrous but midribs beneath often weakly to strongly spinulose. 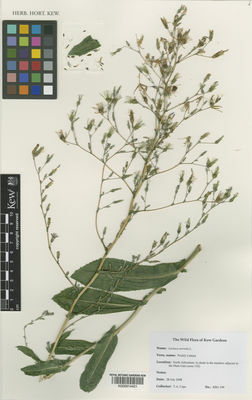 Synflorescences paniculate, divaricately branched; branches up to 23 cm. long, glabrous; capitula on slender, bracteate stalks up to c. 4 cm. long. Involucre 6–8 mm. 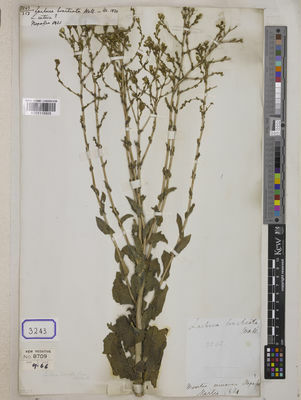 long and cylindric at time of flowering, increasing to 13 x 3.5 mm. and becoming conical in fruiting capitula. Phyllaries glabrous, c. 2 mm. long outside increasing to c. 13 mm. long inside becoming narrowly lanceolate, margins becoming involute. Florets c. 14 per capitulum; corollas yellow, c. 9 mm. long, tubes slender, ± densely pilose about the mouth; ligules erect, c. 5 mm. long, lorate. Achenes pale- or greyish-brown; beaks paler, equalling or exceeding the achene in length; achene 3 x 1 mm., oblanceolate, somewhat laterally compressed, broadly-ribbed on the margins and narrowly c. 5-ribbed on each face, hispidulous towards the apices; pappus several-seriate of numerous white, barbellate setae c. 4 mm. long, free on the apically expanded beak. Lactuca altaica Fisch. & C.A.Mey. Lactuca angustifolia Lam. ex Steud. 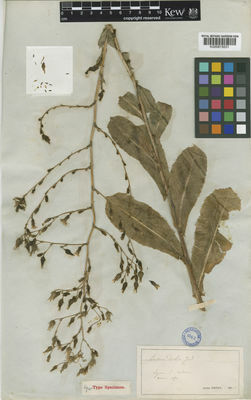 Lactuca scariola var. integrata Gren. & Godr. Lactuca scariola var. integrifolia (Gray) Bogenh.